n the last issue we acknowledged the “Call of The Stage” and the allure of troupes. Let’s continue looking at the impact of performing and the changes it brings to–or signals in--the dancer. This phase is a stage of growth akin to a “second puberty”, especially to the new dancer or performer. We dance because it brings us joy, and makes us feel good. We also know our health improves from the exercise of dancing--as a society we're hyper-conscious of our physical state: our blood pressure, heart rate, cholesterol, muscle tone, flexibility, etc.--but we're less aware of the dance's impact on our psychological, emotional, and spiritual well-being. We understand belly dance is "empowering" because it encourages individual growth. Many dancers affirm that they and their lives have changed--for the positive--after taking up belly dancing. In fact, sometimes it appears that students start studying belly dance at the same time they're beginning to go through momentous life changes - of job, marital status, or just personal approach to life. Although it’s not so clear to students themselves, many experienced teachers notice that after practicing belly dance a year or so, some students show marked emotional and/or mental changes. These students have unwittingly entered a transitional phase in their life, and now their usual patterns of behavior or problem-solving may not serve them well anymore. But these difficult experiences are often signposts on the path to a deeper maturity. Belly dance movements seem to involuntarily increase latent energies in the mind/body/spirit system much like hormones stimulate the onset of physical puberty. Or it could be the other way around: perhaps the awakening maturity of our inner self causes us to seek reasons to move like this. It’s believed that Yoga originally developed this way. and poses from kundalini yoga and chakra-energizing exercises. In fact, the emotional/psychological effects experienced after a year or two of belly dance practice sound much like the description of kundalini awakening, though at a slower pace. Perhaps, if used appropriately and with conscious intent, belly dancing could become an effective part of integrative therapy - not just "body work", but energy work. and the emotions and causes 'upgrades' in behavior and thinking/feeling"
Sovatsky(2,3) describes belly dance as 'spontaneous yoga'. He theorizes that the movements stimulate the onset of a "post-genital" puberty, perhaps by increasing output from the pineal and/or pituitary glands. As I said earlier, it may also work the other way around, as the maturing intellect/spirit inspires the body to move in new ways to develop itself...rather like a chick struggling out of its shell. 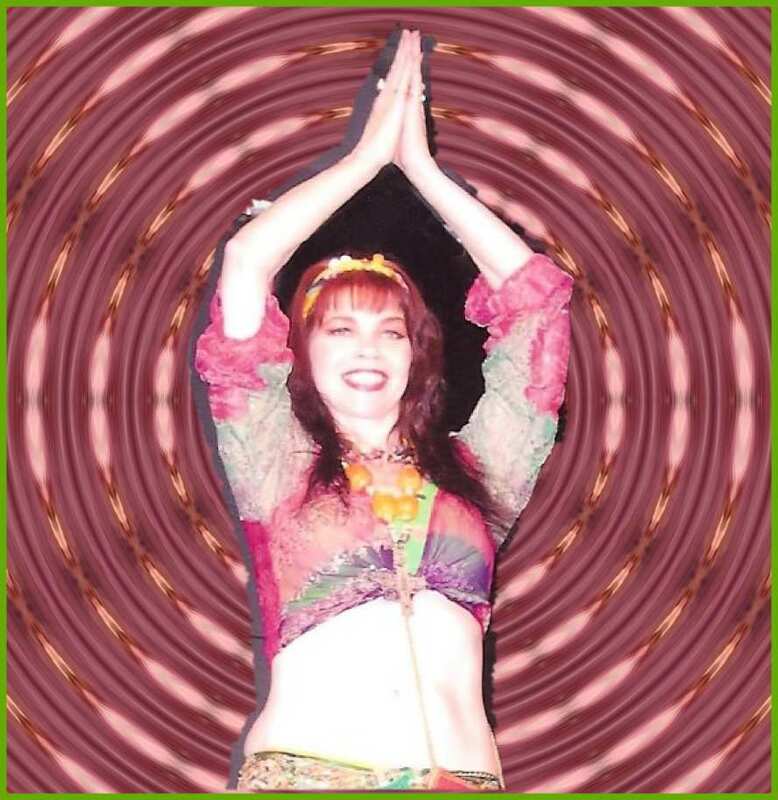 One of the earliest Western explorations of these psycho-physiological effects remains among the best and most interesting: Lee Sannella’s “Kundalini Experience” contains research, case histories, charts, diagrams & illustrations; after reading this you’ll appreciate the interplay of belly dance and music in a whole new way. St. Romain, Philip; Kundalini Energy and Christian Spirituality. New York, USA: Crossroads, (1991?) p. 11. Greenwell, Bonnie; Energies of Transformation, California, USA: Shakti River Press, 1990, p. 75: "'prana' is used by some scholars interchangeably with 'Kundalini' but this is correct only in the most general sense....'(P)rana' is the creative and active energy that flows in the body and operates it functionally and directionally. It links consciousness with the entire operating system. 'Kundalini' is the dormant residual of this energy that lies coiled in the muladhara. Descriptions of 'chi' or 'ki' in Oriental medicine are more akin to the concept of 'prana' in the yogic tradition than to Kundalini." op. cit p. 77: "A stronger & more conscious flow of pranic energy or "chi" is commonly felt by many who practice yoga, acupressure, Tai Chi, Aikido, meditation, and other processes in which there is focus on the breath and concentration."